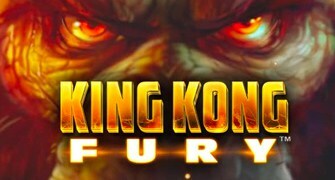 King Kong Fury Slot | NextGen presents the world famous King Kong! We have a surprise for all of you “monster flick” fans. Chances are that you have seen the blockbuster “Kong: Skull Island”. Well, some of you may have an opinion that the whole King Kong idea is exhausted by now. There are countless movies, books, and comics on the subject. But if you still find that you’re captivated by the theme, then you should check out a slot game. The slot game that we’re talking about is King Kong Fury. This game is made by the popular game-design studio NextGen Gaming. Below you will find some more information about what makes this game so special. This game manages to succinctly capture the essence of the experience that you get by seeing the movie. This means that if you have enjoyed seeing the movie, you will enjoy playing this game. NextGen Gaming isn’t exactly known for the quality of their animations. Here too they are not at the top level. But still, the graphics and the animations don’t detract from the overall experience. The background is reminiscent of the movie. You’ll have an impression that you’re living in an ancient world of dinosaurs. The music is also concurrent to the theme of the of the movie. We have to admit that the special effects for some of the bonus features are very well put. We’ll single out the effect for the Lightning Reel Feature. A big lightning strikes across the pay lines and one special symbol is singled out. It really grabs your attention and makes you feel like you’re in the movie. This game is not for the faint-hearted. You will be able to win up to 500 times the amount that you have bet. This is quite the sum we’re talking about here. Everything about this game smells of the possibility of making big money. For one, there are 50 pay lines, no less. Also, there are features in which the wild symbols fall down on the reels. The aforementioned Lightning Reel Feature comes to mind here. In this feature, a big portion of the symbols on the pay lines become wild. This means that you will be able to make huge winning combinations. If a bonus symbol falls on the first and the last reel, then you will trigger a mini bonus game. This is the cheesiest part of the game. A girl is stranded and chained between two obelisks. You’ll be able to get a variable number of free spins. Once the bonus game is over – an awkward image of King Kong comes in and grabs the girl and takes her away. This is one place where the graphics designers could have done a better work. But after this, you will be treated to up to 100 free spins! And the best thing about it is that the free spins can be retriggered ad infinitum. And you can make a lot of money with this. The overall feel of the game is like that of the movies. The symbols are of dinosaurs and of characters of the movie. We’ll say it again – if you have liked the movie, then you will definitely like this game. Try it out and see for yourself.